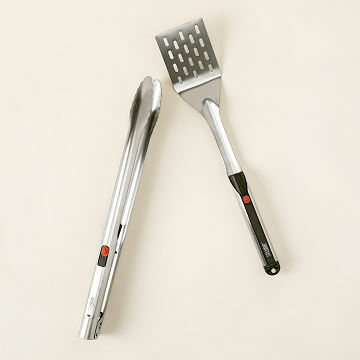 Keep grilling long into the night with this spatula, featuring a built-in LED light in the handle. Don't limit your expert grilling to the fleeting whims of the sun. Laugh in the face of rapidly darkening skies and flip veggie burgers until the incredulous stars come out with this innovative light up spatula. Featuring an LED light integrated into the spatula's handle, this stainless steel design keeps the food flipping, no matter what the "daylight" has to say about it. Made in China. Clever idea as the days get shorter. Less trouble than wearing a headlamp! This is really great for a camping trip, when you aren't sure about the lighting situation for your grill. Sturdy and well-made! Gave this to my parents as a Christmas gift. My Dad loves to grill, even in winter, so this was a perfect gift. Sent me a picture after the first use saying they loved it! Definitely a fun and useful gift for any grill master. Great gift, my dad loved it and the product arrived fast! Very cool concept and as someone who likes to grill in the evening, it was perfect for my father? We grill often at night and this is perfect. I am buying a second one for Father's Day to keep on our trailer!